The first book bound in a patterned paper designed by Ricketts was published by the Vale Press in the Spring of 1896. The Saturday Review (4 July 1896) welcomed The Poems of Sir John Suckling as 'the best edition so far of this better known than edited English gentleman and poet', and considered it to be 'perhaps the most attractive of the first three of Messrs. Ricketts & Hacon's Vale books'. 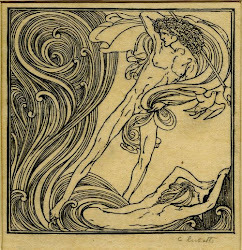 The two earlier books (April 1896) were not issued in patterned papers. Early Poems of Milton was bound in white buckram and the next one, Landor's Epicurus, Leontion and Ternissa was issued in plain blue paper boards. At first, the books did not sell well, only an odd twenty copies were ordered, as Lucien Pissarro wrote to his father Camille in 28 April 1896. (*) He also reported that 'la Maison H & R m'achetera une presse de grande dimension pour l'imprimerie des choses en couleurs - Je suis en train d'imprimer pour eux un papier pour la couverture d'un de leurs volumes'. Although Hacon & Ricketts may have had the intention to pay for a large press, intended for colour printing, the plan fell through, and Pissarro printed his first books on a press he hired in the Epping based printing shop of Alfred B. Davis. We may assume that the patterned paper for the Suckling edition was printed in Epping as well. These conventional symbols (roses, cherries) represent the only floral motives in this selection of Suckling's poems. 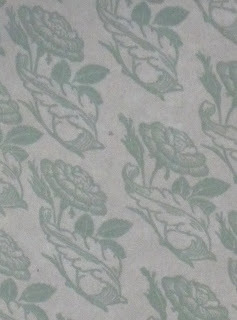 Colin Franklin described the patterned paper as 'a dianthus which seems to sprout rose leaves and oak leaves slants' (**). 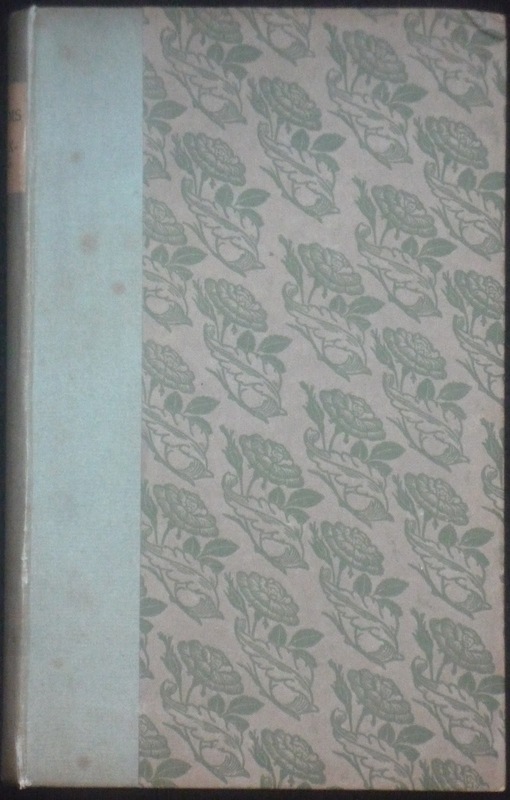 In his own bibliography of 1904 Ricketts described the bindings as: 'Bound in a patterned paper designed by C. Ricketts'; the design lacks a name. I am not sure about the dianthus, although a complex design incorporating more than one plant (dianthus, oak and rose) is not unlike Ricketts at all. Most commentators settle for a rose. There are other floral patterns in the book. Illustrating the first text page is, what Ricketts called, a 'Border of Honeysuckle', and there are illustrated initials incorporating flowers and leaves. 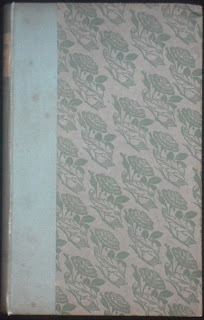 Roses (love), oak (immortality), and honeysuckle (devotion) - it is hard to see a connection between the poems and the pattern of the cover paper, and it is equally difficult to see a 'floral' relation between the paper cover and the opening border. For this publication, the private press law about the unity of the book seems not to have been obeyed by Ricketts in terms of symbolism, but then, this law was formulated only to advance the material unity of the book. Probably, Ricketts's intentions with the Suckling design were not to evoke Suckling's inner thoughts, but his own. Ricketts's wish was 'to give a permanent and beautiful form to that portion of our literature which is secure of permanence', and his decorations were inspired by 'the desirability of a beautiful and permanent form for it', as he argued in his Bibliography of the Vale Press (p. v, xvi). He also insisted, 'that the decoration is in itself personal' (p. xv). All this may have been represented by the rose (Suckling's poems on love) and the oak leave symbol of immortality (the permanence of literature), but here we have entered the field of conjecture. (*) The Letters of Lucien to Camille Pissarro, 1883-1903. Edited by Anne Thorold. Cambridge, 2003, p. 475, 477. (**) Colin Franklin, The Private Presses. London, 1969, p. 88. The first part in this series on patterned papers was published on 23 November 2011.